Artsy Albums Mini Album and Page Layout Kits and Custom Designed Scrapbooks by Traci Penrod: Happy Birthday Artsy Albums!! ...and what an amazing and rewarding experience this has been! I started Artsy Albums in October of 2011, with a little money and a lot of hope. I prayed I would sell just 100 albums my first year ... I sold many more than that and have created over 2200 since then! Thank you to my supportive family and friends, and amazing customers, who have been there with me through the 60+ hour weeks, crazy deadlines, and paper cuts. We've saved a lot of memories in 5 years and helped many customers tell their stories on the pages of albums that will be passed down for generations. 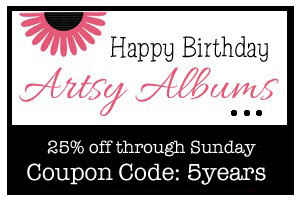 To celebrate, please use coupon code 5years to receive 25% off at Artsy Albums through Sunday (not valid on custom orders)!